Believe it or not, I was a kid who actually liked Brussels sprouts. I really didn’t mind the leafy green mini-cabbage-looking-things at all. They were kind of neat and different. These days, I kind of love them. A whole lot of flavor can fill those leafy layers…such as the ginger, honey and bacon that simmer into these Glazed Brussels Sprouts to make them sweet, smoky and fabulous. The recipe comes from McCormick – I’m one of seven bloggers who are teaming up with the company this holiday season to celebrate what they’re calling the “Seasonal Seven Flavors”. These Seven – cinnamon, nutmeg, poultry seasoning, ginger, sage, vanilla, and peppermint – represent the flavors we most often think of as the taste of the holidays. If the seven of us participating bloggers were a popular British girl band from the ’90s you could call me Ginger Spice! I’m the one who gets to share recipes to heat up the holidays with ginger in the weeks to come. 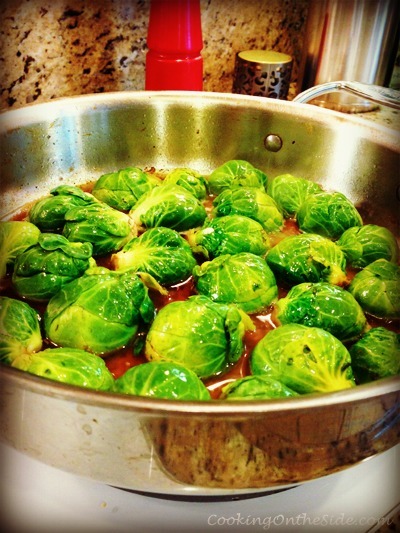 I’m starting with these Glazed Brussels Sprouts, where ginger adds warm, almost floral notes to this easy side dish. It would be perfect for your Thanksgiving table or any cool autumn evening. Cook bacon in large skillet on medium-high heat until crisp. Remove bacon. Drain fat, reserving 1 tablespoon in skillet. Place Brussels sprouts, cut-sides down, in skillet; cook 1 minute. Mix broth, honey, ginger and orange peel in small bowl until well blended. Add to skillet. Reduce heat to medium. Cook, uncovered, 10 to 15 minutes or until liquid has evaporated and Brussels sprouts are crisp on the outside and tender on the inside. Sprinkle with bacon. I love Brussels sprouts now, but I hated them when I was a kid because my mom boiled them. But roasting or sauteing, that’s a different story! These look delicious–perfect for Thanksgiving too! Funny, I don’t know too many people that grew up liking brussels sprouts – I know I didn’t, but now I do. Just picked up a branch of them today from Trader Joe’s. I’ve never tried making them with ginger – it must give the sprouts a little sweetness. Will have to try that. I’m all about ginger as well, I love the spicy heat! 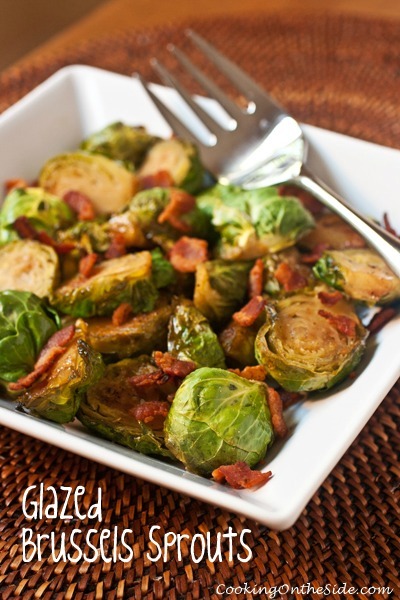 Bacon and Brussels sprouts! I can’t think of a better combination! Visually appetizing, simple recipe and I can sense the flavor oozing in each layer of Brussels. For me I like it to be real smoky, will extra loads of bacons do the trick? As a kid, I didn’t like Brussels sprouts but I’ve recently tried them again and now they’re quite okay although I cannot convince my boyfriend to eat them.